Antigua-Guatemala or Antigua, was once the capital of the Kingdom of Guatemala. Its baroque architecture and its ruins have made it famous. Listed since 1979 as a UNESCO World Heritage Site, it has become an ideal tourist destination for all tourists in search of total disorientation. Its many assets and its wealth make this city a must for any traveler. 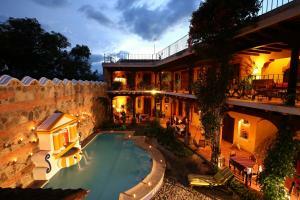 Located in the valley of Panchoy, it is surrounded by three world-famous volcanoes. If in 1773, a colossal earthquake destroyed the city, the ruins of the old city are now rehabilitated and can be visited. Today it is known for the friendly atmosphere that reigns there and its buildings of various influences whose beauty is breathtaking. It is an excellent starting point to discover the treasures of Guatemala. To get acquainted with the cultural heritage of Antigua, a visit to its city center is essential: you can discover the history and culture of the city through its unique architecture. This one is described as colonial and baroque style. The Arch of Santa Catalina is probably one of the most famous buildings in Antigua. A true symbol of the city, it is particularly famous for its bright colors. This majestic building is a must in Antigua and you will not be able to pass by. Not far away, the Santo Domingo convent, located in the street of the same name is also worthy of interest. Built in 1551, it has not lost any of its splendor and remains one of the most beautiful historical monuments in the city, enclosing part of the history of colonization and religious life of Guatemala. Part of the convent is now transformed into a hotel. The rest consists of a garden and a museum. The temple of the Jesuit company, built in the 16th century, is also a must in the city. Although only ruins remain, the vegetation that covers it makes it a haven of peace and quiet for locals and tourists alike. Its walls covered with flowers and greenery give a unique identity to what remains of buildings. At the Guatemalan embassy, ​​located near the temple, you will find a permanent exhibition on the city, revealing the secrets of its history. But Antigua would probably not be what it is without its central place. This gigantic place houses a park, a fountain and a huge cathedral entirely white. The warm atmosphere that reigns on the square makes it all the more charming. In front of the cathedral, you will find the Municipal Palace which houses a small museum on the city. You will be able to learn more about its history and its creation. The exhibition also addresses the famous earthquake that once destroyed much of the city. The visit allows us to better know this small town of Guatemala. All around the square are various restaurants and other cafes that offer delicious dishes. This will be an excellent opportunity to discover local specialties. 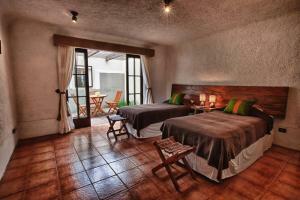 The cafe condesa is located in a colonial house and offers menus of very good quality. The Palacio de los Capitanes Generales was built in the middle of the XVIth century. . It becomes the center of administrative decisions of the city. Its bad maintenance makes it not accessible to the public but you will be able to observe all its facade which profits from a remarkable architecture. 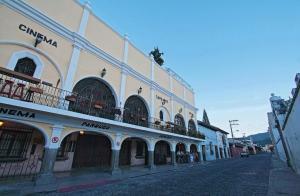 Antigua Guatemala is also home to a large number of colonial houses that have kept their stamp. It is a pleasure to discover his houses. Among the best known are casa de los leones and casa popenoe. All these houses are arranged in the same way. 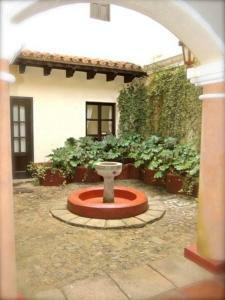 There is a garden in a central courtyard. These gardens are often well maintained and beautify the place. The Capucine convent is another architectural masterpiece that you can visit in Antigua. It is now partly in ruins but remains interesting to see. The Church of Merced is a magnificent religious building of Antigua. Its richly decorated facade will delight you. The ruins of Santa Clara Convent will impress you just as much. Do not hesitate to stay for a moment to contemplate these vestiges of a bygone era. The Plaza de Armas is a must see place. It concentrates several beautiful buildings such as a fountain, located in its center. The fountain of the sirens was built in 1739 by the architect Miguel Porras. It radiates throughout the square which is surrounded by various religious buildings with remarkable architecture. Once you have visited all these monuments, you can go for a tour in the different museums that Antigua contains. At the Santiago museum located in the old town hall, you can attend an exhibition of ancient objects that date back to the colonial era. Not far from there you will find the Libro Antiguo Museum which focuses on the history of printing. The colonial museum is located in a Moorish style building of the most beautiful effect. Sumptuous works of art from the colonial era are preserved there. All these museums will allow you to know more about the history of the city and its evolution and it is very interesting to discover objects of an era as old. The works of art exhibited are of a very high quality. Art and history lovers, as well as the curious, will be delighted as they walk through the corridors of these establishments. A museum of cocoa and chocolate is also present in Antigua. The entry is free. Antigua is indeed a destination known for its cafes and chocolates. You will be able to buy chocolate from various artisans present throughout the city. These are very tasty and allows to find the true taste of chocolate. It is also possible to visit coffee plantations. Guided tours are regularly organized. You will be able to see for yourself how the coffee is produced and what the plantations of these seeds look like. The surroundings of Antigua also have wonders not to be missed. Attitlan Lake is a three-hour drive away but the trip is well worth it. The indigo color of the lake and its calm waters will charm you. Every year in Santiago de Atitlan there is a huge celebration celebrating one of their idols: the Maximon. You may have the opportunity to attend and enjoy an exciting atmosphere. This holiday is one of the biggest of the year and the whole village goes down to the street to have fun. In Antigua, Holy Week is also a great holiday moment. Throughout the city are carpets of flowers and a gigantic procession takes place. Music reverberates throughout the city and everyone is dressed especially for the occasion. The flower beds give a unique and splendid color to the city and the party is in full swing throughout the week. You may be lucky enough to attend this fantastic celebration, which attracts a large number of people every year. Antigua is also known for the three volcanoes that surround it: Agua, Fuego and Acatenango. Another 25 kilometers from Antigua is the Pacaya volcano, whose summit is 2,552 meters high. For hikers, it is possible to climb this volcano. For this, you do not have to be a very experienced walker since walking is accessible to everyone. In two hours of walking, you will reach the summit of this active volcano. From there you can enjoy a unique panorama of Guatamala. In Antigua, you can also taste delicious dishes typical of Guatemalan gastronomy. Various restaurants welcome you and offer you succulent dishes. You can enjoy meat dishes such as carne guisada but also fish soups. There are also establishments offering less traditional cuisine. Notable fact: you can find a Mc Donald's located in an old colonial house, classified building history. The setting is rather exceptional and enjoyable. Your stay in Antigua will be an opportunity to taste new flavors that will delight your palate. Antigua is therefore a particularly surprising destination. Its historical and architectural richness and its magnificent streets give an exceptional identity to the city. We continue to discover beautiful places. In addition, it always reigns a pleasant and friendly atmosphere. There are also several small artisan shops where you can buy souvenirs prepared with care by local artisans. There is also a large covered market where you can buy local products of very good quality. So do not hesitate and leave for this fantastic destination that is waiting for you to reveal all its treasures. The nearest airport to Antigua is that of Guatemala City, called the Aurora airport. From there, you can take shuttles or taxis that will take you directly to your destination. Be careful though as cases of theft on tourists have been regularly reported. Once in Antigua, you will see that the small size of the city makes it easy to walk. A good way to discover the city and its surroundings is to rent a scooter or motorbike. You will be able to move faster while enjoying the landscapes that pass before you. You can take a bus to Pacaya Volcano for example. You should not have too much trouble moving to Antigua and its surroundings.